A great option for cycling travelers who want to slow down and enjoy some meaningful cultural interaction with people during their visit to Thailand and Laos. to browse the stalls for souvenirs before heading back to Chiang Mai. will be waiting at the trail end to transport us two hours to Chiang Rai. After leaving Chiang Rai, you follow the Kok River north through fruit plantations and paddies. You also pass a rubber plantation, something uncommon in Northern Laos. Chiang Saen, the oldest urban settlement of Thailand and former capital of the Lanna Kingdom, is in a beautiful location on the banks of the Mekong river. In the afternoon, you can visit the viewpoint in the heart of the Golden Triangle. The first stage of today’s ride is easy going. With mountain backdrops, the road follows the Mekong river through picturesque hilltribe villages, tobacco and rice fields. The last 12 kilometers are more challenging, with some steep but short ascents. The road joins the main road just before the entry to Chiang Khong, the border entry to Laos. This is the last night that you will stay in Thailand on this tour. This morning we board our slow boat for our journey to Pakbeng. The ride is slow and laid-back, passing through spectacular scenery as you chug through the mountains of Udomxai Province to arrive at Pakbeng some 10 hours later. This journey gives a wonderful insight into how important the river is to the survival of the Lao people – not only as a means of transportation, but for irrigation, its fishery, and the shipping of goods to areas inaccessible by road. After a one hour transfer, we are cycling in very rural Laos, an area inhabited by hill tribe villages who eke a meagre existence from the land. 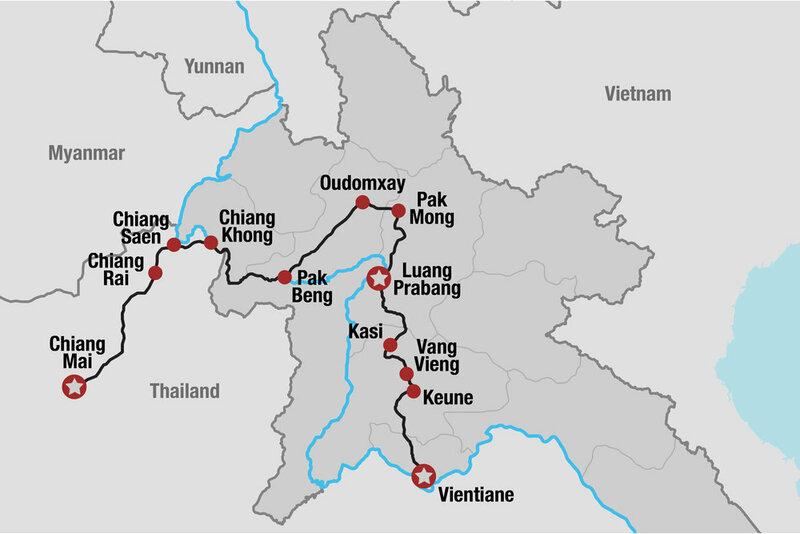 Along the way, you will pass villages of Phu Tai, Tai Lu, Hmong, Tai Dam, Lao and Khamu. The people are very friendly and not yet tired of seeing tourists. We stop at weaving villages along the way, where you still see families sitting in the shade weaving on old looms. After climbing a 300 meter pass, a long descent brings you to Oudomxay, the capital of the Oudomxay Province. We'll head back into the jungle for stretches of this spectacular route; although hilly, it soon gives way to gentler gradient and opens to magnificent scenery and finally a 30 km downhill ride to Pak Mong, a small supply depot town. This is one of the more difficult days of the trip, so you have the choice of challenging yourself or firing up your camera from the comfort of the vehicle. Add an extra day to your trip to enjoy the amazing 100 waterfalls trek. Start the day with a 2 hour boat ride down the serene Nam Ou River before flatter and better roads today will enable you to complete the longer distance to Luang Prabang. Only a few minor passes have to be climbed before you're cycling along the banks of the Nam Ou river with stunning views of huge mountain ranges. On the last stage of the day, you'll be cycling through teakwood plantations before arriving in Luang Prabang. Luang Prabang remains one of Asia's most beautiful historic towns, earning it the status of a World Heritage Site in 1995. Rising from the confluence of the Mekong andNam Khan Rivers, it is popular for its many temples and preserved French colonial architecture. There are also ancient monasteries and a Royal Palace Museum. For those who still have energy, optional activities around Luang Prabang include kayaking, trekking, elephant riding, or a jungle trek to Kuang Si waterfall.